From the author of the acclaimed Against Love comes a pointed, audacious, and witty examination of the state of the female psyche in the post-post-feminist world of the twenty-first century.Women remain caught between feminism and femininity, between self-affirmation and an endless quest for self-improvement, between playing an injured party and claiming independence. Rather than blaming the usual suspects–men, the media–Kipnis takes a hard look at culprits closer to home, namely women themselves. 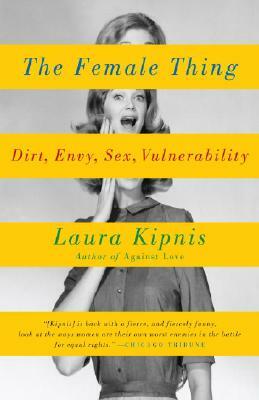 Kipnis serves up the gory details of the mutual displeasure between men and women in painfully hilarious detail. Is anatomy destiny after all? An ambitious and original reassessment of feminism and women’s ambivalence about it, The Female Thing breathes provocative new life into that age-old question. Laura Kipnis is a professor of media studies at Northwestern University. She has received fellowships and grants from the Guggenheim Foundation, the Rockefeller Foundation, and the National Endowment for the Arts. She is the author of many essays and articles on sexual politics and contemporary culture, and of the book Against Love: A Polemic.